By ripening green tomatoes at the end of the season, you can enjoy fresh tomato taste for weeks after a heavy frost, sometimes even up to Thanksgiving! Of course, the best way for tomatoes to ripen is on the vine. But late tomatoes may not have that luxury. As summer gives way to fall, keep an eye on your fruit. When the forecast is for the season’s first heavy frost, it’s time for a final harvest. 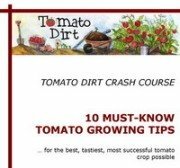 You can harvest an entire plant (or a branch) or harvest individual tomatoes. How to harvest a plant (or branch). Carefully dig up plants including roots (or cut off a branch with fruit). Shake off extra dirt. Leave green tomatoes on the vine. Wrap a piece of string or twine around the base of the stem, just need the roots, and hang the plant (or branch) upside down. Choose a cool place, like a basement or garage. Check fruit every few days. Pick ripening tomatoes off the vine, or they may get red, fall, and create a mess! After all tomatoes have been harvested, compost the remains of your plant. How to harvest individual tomatoes. Pick fruit off the vine, leaving a short stem. Bring them inside to ripen. When you pick individual tomatoes (rather than lifting entire plant and hanging it inside), you can follow these special tips to ripen fruit. Sort through your harvest. Set and store tomatoes in these groups. Tomatoes in each group will ripen at about the same speed. What about very green tomatoes? Immature green tomatoes have not yet begun to turn white. There’s a good chance they will not ripen, but rather spoil. Plus, they rarely develop a ripened-tomato flavor. Set aside unripened green tomatoes to use in green tomato recipes (like fried green tomatoes, for example). Enjoy them for what they are! Should you wash freshly-picked green tomatoes? The tomato jury is out on this one. Some gardeners say no – don’t wash tomatoes until after they are ripe and ready to eat. Others swear by washing tomatoes once they’re picked, even using a light bleach solution. Late season tomatoes can acquire all kinds of fungi and mold. Washing (and especially bleaching) can remove those nasties and prevent decay over the coming weeks as ripening green tomatoes mature. If you choose to wash tomatoes just after harvesting, make sure they are completely dry before starting your ripening regimen. Light isn’t necessary for ripening green tomatoes! Try these easy methods. In a paper bag. Place green tomatoes in a paper bag with a piece of ripe fruit, such as an apple or banana. Ripening fruit gives off ethylene gas. Ethylene gas works two ways – it also stimulates ripening. That’s why in an enclosed environment, like a paper bag, the apple or banana will help green tomatoes turn red. Check the bag daily until fruit is ready. In a plastic bag. Follow the same steps as for the paper bag method, but poke a few holes in the plastic bag. Insert banana or apple and tomatoes. Let tomatoes ripen in a warm area away from direct sunlight. In a jar. Applying the same principle as with the paper bag method, select a jar and place a ripening banana inside. Place 2-4 green tomatoes in the jar, but be careful not to force them to fit or they could get bruised. Screw on the lid. Place the jar in a warm area away form sunlight. Check the jar regularly. Tomatoes should ripen in a week or two. In newspaper. 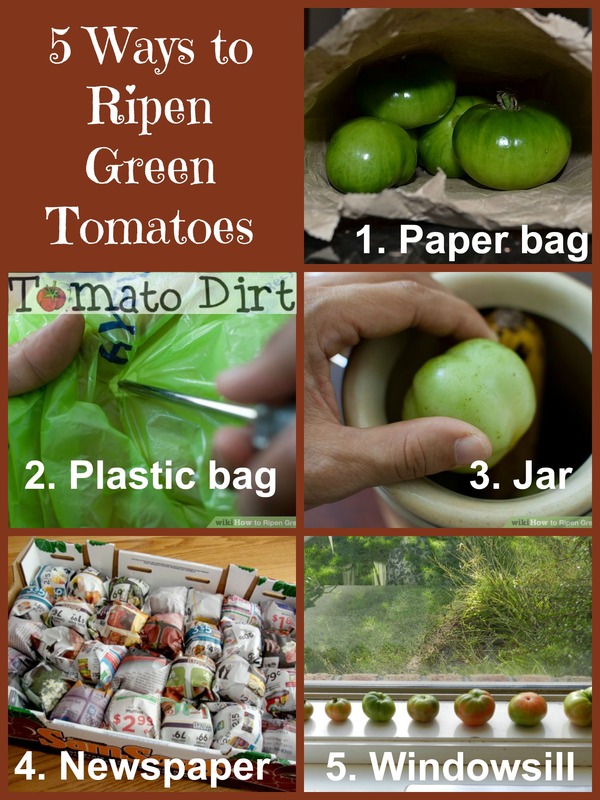 This method works well if you have a large number of ripening green tomatoes. Wrap individual fruit loosely in newspaper. Place them in a box, preferably one layer but no more than two layers deep. Or you can set them on a garden rack (sometimes called an orchard rack or ripening rack). Store them in a cool, dark, dry spot (like a basement or garage). Check every 5-7 days. You can slip a banana in the box to help fruit ripen faster. Tomatoes ripen in 2-4 weeks, depending how far along they were to begin with. On the windowsill. Choose turning, pink, or light red tomatoes (not mature green). 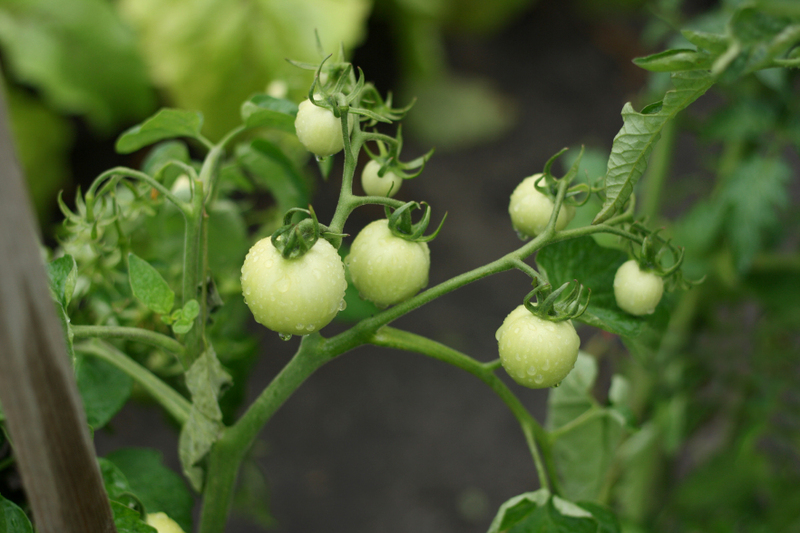 Set them on a windowsill, away from direct sunlight which can cause tomatoes to overheat and ripen unevenly. Turn tomatoes at least once a day until they’re ready to eat. Store mature green tomatoes (those which were harvested at a good size, with a bit of white color) between 55-70ºF while you’re waiting to ripen them. (You can set them on a garden rack or ripening rack in the garage or basement. Get more tips on our Harvesting Tomatoes Pinterest board.